To be automatically notified when something new is posted, just sign up for our RSS feed. It's easy, it's free, and it's anonymous. No need to give us your e-mail address, or any other information. Our new posts will delivered to your RSS reader if you click on the orange "RSS" button in the "box" on the right, and add us to your RSS reader. If you don't know RSS from Adam, click on "What's an RSS feed?" Make 2008 the year you DO something about easing your family’s financial stress. One of the simplest ways to build a family business that can add some additional cash to the coffers is with your own web site. How much you can make with it depends on your own BAM (Brains and Motivation). As with most things, what you get OUT of it depends on what you put INTO it. And, as with most things, having the right tools certainly makes the job easier. This is a tool we can whole-heartedly recommend because we use it ourselves. It is how we created this web site. Right now, the holiday 2-for-1 special has been extended till midnight, Friday, January 4. This is the best price of the year! At the regular price, you pay less than $1 a day for not JUST hosting, but some pretty spectacular features that are included. With the 2-for-1 deal, you can create your own web site for less than 50 cents a day!! I hear you saying, "Well, I don't need TWO web sites!" OK, find a friend. Split the deal. Then EACH of you can build a web site to create a little extra cash for HALF PRICE. Or, make the second site a gift. Encourage your wife to start her own business, so she can eventually quit her outside job and work from home. An online business is perfect for military families, because it's totally portable. It can be operated from any internet connection in the world, and you don't have to worry about finding a new job every time you get transferred! Or give your teenager the gift of an entrepreneurial spirit, learning to make his or her own spending money? But greater still, teaching them to be in control of their own financial destiny, and not dependent on someone else for a paycheck. Teach them the freedom that comes from being their own boss, and never having to worry about being laid off. But hurry -- the special ends at the stroke of midnight on Friday, January 4. See this page for some ideas on how to make this the beginning of your road to financial freedom! Read the story of our own meteoric rise in Google. With a 30-day money-back guarantee, you have nothing to lose! To see how easy it is to build a web page with Solo Build It, click here to add your holiday message to the troops. May this be the year that brings the world closer to peace, and brings your loved ones home safely. Members of North American Aerospace Defense Command (NORAD) are tracking Santa Claus' travels on Christmas Eve, providing detailed information about his whereabouts on the command's Web site and through a toll-free telephone line. Thanks to current technologies, NORAD can precisely, at any time along Santa's flight, identify his location, ensure he has the proper protection and … that he can complete his mission on time. The NORAD elves will track Santa's progress from 2 a.m. Mountain Time Dec. 24 through 2 a.m. Mountain Time Christmas Day, posting details on the command's Web site at noradsanta.org. At any time in this process, they can find out where Santa is and when he should be into their area. Google Maps will be updating Santa's location every five minutes. In addition, children can call the NORAD hotline at 877-HI-NORAD toll-free to check up on Santa. Translators we be on hand to report on his travels in six different languages. They'll also remind children that Santa can't come to their houses if they’re awake! While enjoying the levity of the mission, Air Force Gen. Victor E. Renuart Jr., commander of NORAD and U.S. Northern Command, turned serious to extend thoughts and prayers to young men and women deployed in harm's way around the world and to their families who will spend the holidays without their loved ones. Final Two Days for BOGO Special! Last week we let you know about the best-price-of-the-year special from the company that helps us build and maintain this web site. Buy one web site, get one FREE! You have up to nine months to activate the second one, so you don't have to worry about trying to start two at once. Keep them both, make one a gift, make both of them gifts! There's probably someone on your list who would love to have their very own web site. 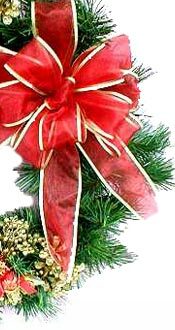 To see how easy it is to build web pages using this company, go to Holiday Messages and post your holiday greetings for our troops. If you know someone who might like a way to generate some extra cash without leaving home, or having to pay for child care while they work, take a look at this page. What better way to encourage creativity in your teenager, while letting them learn how to earn their own spending money? Or give your spouse the gift of freedom to work from home? If you're afraid the technical aspects of building a web site are just too complicated, don't be -- Solo Build It makes it easy enough for beginners (even technically-challenged ones, like me). They do the technical stuff in the background, so you can focus on your message. If you want to learn more about how this company can help you Build a Website that Works, click here. 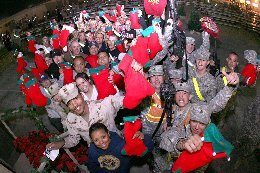 Many of you have asked how to send holiday messages to the troops. So we've set it up for you to post your message right here! Please post your holiday message of thanks to those who are defending and protecting our way of life, and ensuring that we have the opportunity to enjoy a peaceful holiday with our own families. Also share holiday stories, poems, etc. Let the troops know you remember them this holiday season! We've brought you warnings about other scams. This is not so much about a "scam," but rather a caution to be careful about which charities you support, when you give generously to organizations you believe will use those funds to aid service members, veterans and their families. We're bringing you this information to help you ensure that your hard-earned dollars are actually going to the causes you want to support. The Chairman of the Joint Chiefs of Staff issued his holiday message, thanking service members and families for their service, and asking that others remember their sacrifices. "I thank each of you for your dedicated service as you defend our national interests around the world. Whether on the ground, in the air, on the sea, or under it, you are making life better and safer for millions of people. Please know you have your nation's deepest gratitude," the statement from Navy Adm. Michael G. Mullen reads. Last week we mentioned the "Christmas parade" of 10,000 Christmas wreaths from Maine to Washington, DC. 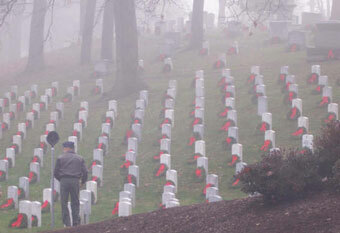 On Saturday morning, about 3,000 volunteers showed up at Arlington National Cemetery to help place the donated wreaths. They came from around the country, some with tears in their eyes, putting holiday demands on hold to honor veterans most never knew. In a few hours in freezing temperatures, the volunteers placed more than 10,000 balsam fir wreaths with blazing red bows on graves at Arlington National Cemetery. Merrill Worcester, owner of Worcester Wreath Company in Harrington, Maine, donated the wreaths "to remember the fallen, honor those who serve and teach our children the value of freedom," he said. Find the full story and video here. 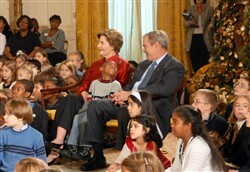 President and Mrs. Bush recently hosted a White House Christmas Party for 200 children of American service members in the East Room of the White House. About half the children there had a deployed parent. The President told the children he had two jobs there: one was to introduce them to the First Lady, and the other was to "tell you how much we admire your moms and dads (and) how much we appreciate their service to our country." Mrs. Bush officially began the annual holiday party with . . . more. Need a Great Gift? Double the fun! Not quite finished with your Christmas shopping? Having trouble finding that "just-right" gift for someone on your list? someone wanting to work from home? a student, needing to make some spending money? someone who's retired, but not ready to retire to the Lazy-Boy and watch TV all day? someone with a passion for sharing knowledge and information with others? Then we have just what you need, and it's something that won't be returned because they didn't like it, or it didn't fit. In fact, you may suddenly become their favorite person after giving this gift! Most of us would like a way to provide a little extra "spending money." Who couldn't use a little extra cash? Solo Build It, the company that helps us create and maintain this web site, just announced its Christmas special. This is the best pricing of the year! Until midnight on Christmas day, you can purchase one site, and get a second one FREE! Use one yourself, and make the second one a gift. Or make gifts of both of them. But don't hesitate - this special is only good until Christmas. Have an old used laptop gathering dust somewhere, but don't know how or where to get rid of it? Here's some great news! You can donate a laptop to help troops stay in touch with loved ones at home. And it's a tax-deductible gift! "A Date That Shall Live in Infamy"
December 7, 2007 -- Today is Pearl Harbor Day. This one has been around since at least '05, but it must be circulating again, because we just got a notice about it from a retired Navy friend who is also a retired police investigator. You answer the ringing phone. 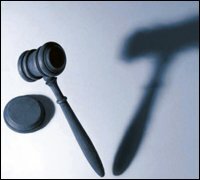 The caller identifies himself as an officer of the court. He says you failed to report for jury duty and that a warrant has been issued for your arrest! You panic -- you never received a notice about jury duty. Now what do you do? More. WASHINGTON, Nov. 26, 2007 – If you are wounded in combat and discharged as a result, you will not have to pay back your enlistment bonus, Defense Department officials said here today. "Bonuses are not recouped simply for one's inability to complete an enlistment or re-enlistment agreement through no fault of the military member," a policy statement said. Pentagon officials re-stated their policy after a wounded soldier in Pennsylvania received a bill from the Army. Jordan Fox was a private first class in Baquba, Iraq, when he was wounded in the explosion of an improvised explosive device. Fox suffered vision troubles in his right eye and suffered a back injury when the bomb went off in May. You may be surprised to learn some of the ways your credit score can affect your life. Many of us naively believe the only time our credit score matters is when we apply for credit to make a purchase, or for a new credit card. Don't Throw Away Those Expired Coupons! Wait! Before you toss those expired coupons, read this. Did you know that military families overseas can still use coupons that have expired for six months after the stated expiration date? This would be a great project for your school or church group, or Scout troop. It costs you nothing, except a little time and postage, and expired coupons that are useless to you can still help a military family stretch their budget a little farther. OOPS! Unfortunately, we passed along some bad info and we want to correct the error ASAP. Several days ago, we encouraged you to send cards to recovering service members at Walter Reed Army Hospital and the National Naval Medical Center at Bethesda, Maryland. Since then, however, we've received word from Walter Reed that such cards will not be delivered, unless addressed to a specific individual. Apparently, that decision was made in response to the anthrax-by-mail scare a few years ago. Walter Reed Army Medical Center officials want to remind you that Walter Reed cannot accept letters, cards, or packages addressed to 'Any Wounded Soldier' or 'A Recovering American Soldier,' or other similar addresses. This decision, by then Deputy Undersecretary of Defense for Transportation Policy, was made in 2001 to ensure the safety and well being of patients and staff at medical centers throughout the Department of Defense. It applies at Bethesda as well. The outpouring of encouragement from the general public, corporate America and civic groups throughout the past year has been incredible. Our Warriors in Transition (at Walter Reed) are amazed at the thanks and support they receive from their countrymen. Instead of mailing an "Any Wounded Soldier" letter or package, please consider personally delivering them to your local VA Medical Center to be distributed by the volunteers there, or making a donation to one of the more than 300 nonprofit organizations dedicated to helping our troops and their families, listed on the "America Supports You" website. Your local VA Medical Center, military installation, the local National Guard or military reserve unit in your area may offer the best alternative to show your support to our returning troops and their families. To locate the VA Medical Center nearest you, click here. Fisher House is an organization that builds "comfort homes," similar to Ronald McDonald Houses, on the grounds of military and VA hospitals to provide no-cost or low-cost temporary housing for families of recovering service members. It is totally privately funded. For the fascinating story behind Fisher Houses and those responsible for their creation, click here. Please accept our apologies for passing along this bit of bad advice. We know you'd like to show your support, and we'll continue to highlight ways you can. For those who feel they can't afford to install a security system in their home, here's a tip that will give you some added security and peace of mind. You know the key fob that holds your car keys and unlocks the car doors? You can use it as an alarm when you're at home! October 26, 2007 -- Forty years ago today, Arizona Senator and Presidential hopeful John McCain was shot down on a bombing mission over Hanoi. McCain had just released his bombs over the power plant when his A-4 was hit by a surface-to-air missile, ripping off one of the wings. As the jet spiraled out of control, McCain was forced to eject over downtown Hanoi. He broke both arms and one leg when the ejection seat fired, leaving him completely defenseless. He was lucky enough to land in a lake, and after sinking all the way to the bottom, was somehow able to inflate his life vest by pulling on the fitting with his teeth. He was immediately surrounded by Vietnamese, who inflicted bayonet wounds in addition to his other injuries before transporting him to Hao Lo Prison, the infamous "Hanoi Hilton." After an unsuccessful attempt to reset his right arm, without benefit of anesthesia, McCain was fitted with a plaster cast from the waist up, holding his arm up at an awkward angle. Certain that McCain would not survive his injuries, prison officials placed him in the care of USAF Col. George (Bud) Day, a move which would allow them to say he died in American hands. But McCain was determined not to die, and Bud Day was determined not to let him. Day nursed him back to health, at least as close as they could come, and as soon as McCain was able to walk on crutches, Day was removed from his cell. McCain would spend the next 31 months in solitary confinement. That gives a man plenty of time with his own thoughts, to learn who he really is. And John McCain was, and is, a man of faith, integrity, and courage. When his captors learned that the 31-year-old McCain was the son of a high-ranking Navy Admiral, he became eligible for "special treatment." He was routinely tortured, brutally. The only time he was allowed out of his solitary cell was to attend a Christmas Eve service. After being ordered to participate, and despite the knowledge that it would result in a severe beating, McCain spoiled the service because he realized it would be used as propaganda, as "proof" of their humane treatment. As a result of his father's rank, McCain was offered early release. Again, determined not to be a propaganda tool for the Communists, he refused to leave before the men who had been captured earlier than he was. A stirring tribute by fellow POWs, including Medal of Honor recipient Bud Day. In an emotional ceremony in the East Room of the White House, President George W. Bush presented Maureen and Dan Murphy with the Medal of Honor awarded to their son, Navy Lt. Michael P. Murphy. Lt. Murphy was killed in Afghanistan in June 2005, when his four-man SEAL team, on a reconnaissance mission, was surrounded by Taliban fighters. After a two-hour firefight, Murphy and two others were dead, along with an estimated 35 enemy fighters. The fourth SEAL, Hospital Corpsman 2nd Class Marcus Luttrell, made a heroic escape, evading enemy fighters and walking seven miles despite severe injuries. Local residents hid him from the Taliban, and delivered a note to nearby Marines with his location, leading to his dramatic rescue. The Medal of Honor is the United States' highest military award. Murphy is the first U.S. service member to earn the MOH for combat action in Afghanistan in the Global War on Terror (GWOT). His award is the third MOH awarded since the GWOT began. We're delighted to be sharing our tips and techniques for reducing debt and creating wealth with readers around the world. Although the site is written specifically for our U.S. military service members, the information is applicable to and useful for just about anyone. Currently, we have visitors from at least 45 countries around the world. To check the list to make sure you're represented, click on the "PermaLink" below. If you don't see a listing that represents you, please let us know via our contact page, so we can add you to the list. September 19, 2007 -- Today, SpouseBUZZ celebrates its first birthday. We'd like to congratulate the authors on the virtual support they've provided to the worldwide community of military spouses. They've created a real sense of community, where milspouses can find like-minded spirits who truly understand what you're going through, because they've either been there, or are there now. They understand how frustrated you get with the constant upheaval of military life, and how totally clueless your civilian friends and neighbors really are about the life your family lives. Whatever your current situation, there's likely to be someone there who's in a similar situation and can offer you support and helpful suggestions. You're not alone in your thoughts and feelings, and at SpouseBUZZ, you'll find support from others who truly understand. They even have a live radio show, and host virtual Pajama Parties! So, if you haven't discovered SpouseBUZZ yet, click on over and wish them all a Happy Birthday! In a recent post on SpouseBuzz, airforcewife was lamenting the fact that her local Home Depot store no longer honors a military discount (it's up to each individual store). After reading her post, we were inspired to begin this page, to list places where you can still find discounts offered to military members and military families. As those who posted comments to airforcewife's post indicated, it's not the amount of the discount that matters, but rather just the fact that there IS a discount offered, an acknowledgment of the quiet sacrifices our military members and their families make on a daily basis. In many parts of the country, foreclosures are at an all-time high, following surges in the housing market and an epidemic of sub-prime adjustable loans allowing families who previously could not qualify for mortgages to do so. The result is that many families in recent years have bought homes that really were out of their reach, made possible only because the low interest rate kept the payments within the realm of the do-able. Unfortunately, as the adjustable-rate mortgages begin to adjust upwards, the families can no longer afford the payments, and they begin sliding down the slippery slope towards foreclosure. If you are unable to make your mortgage payment: click here. Veterans Now Permitted to Salute the Flag! WASHINGTON, D.C. – U.S. Senator Jim Inhofe (R-Okla.) recently praised the passage by unanimous consent of his bill (S.1877) clarifying U.S. law to allow veterans and servicemen not in uniform to salute the flag. Current law (US Code Title 4, Chapter 1) states that veterans and servicemen not in uniform should place their hand over their heart without clarifying whether they can or should salute the flag. "The salute is a form of honor and respect, representing pride in one’s military service," Senator Inhofe said. "Veterans and service members continue representing the military services even when not in uniform. "Unfortunately, current U.S. law leaves confusion as to whether veterans and service members out of uniform can or should salute the flag. My legislation will clarify this regulation, allowing veterans and servicemen alike to salute the flag, whether they are in uniform or not. "I look forward to seeing those who have served saluting proudly at baseball games, parades, and formal events. I believe this is an appropriate way to honor and recognize the 25 million veterans in the United States who have served in the military and remain as role models to other citizens. Those who are currently serving or have served in the military have earned this right, and their recognition will be an inspiration to others." Great News! Amendments to the Fair Credit Reporting Act have made it a little easier for deployed service members to protect themselves against possible identity theft while they are out of the country. If you are on active duty and away from your usual duty station for an extended period, you can add an "active duty alert" to your credit reports with the major credit reporting agencies. This should help minimize the risk of identity theft while you are deployed, because when a business sees the alert on your credit report, it must verify your identity before issuing credit. To learn how to place an “active duty” alert, or to have one removed, and for the toll-free fraud number of the three nationwide consumer reporting companies, click here. Whitman School of Management at Syracuse University has announced a new Entrepreneurship Bootcamp for Veterans with Disabilities (EBV). The program is designed to offer cutting edge, experiential training in entrepreneurship to veterans returning from Iraq and Afghanistan with disabilities. The goal of the EBV is to open the door to entrepreneurial opportunity for disabled veterans, by helping them develop competencies in the many steps and activities associated with creating and sustaining an entrepreneurial venture (and there are many - trust us), and also helping them to understand and coordinate with other programs and services for veterans and others with disabilities. For more information about the program, click on the link below.